Embedded Linux is used in embedded computer systems found in consumer electronics devices, as well as in networking equipment, machine control, medical and scientific instrumentation, and industrial automation. Critical Link offers several SOMs, embedded CPU engines, that support the embedded Linux operating system, as well as Windows XP Embedded and QNX. 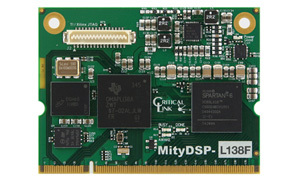 These are the MitySOM-1808, and the MityDSP-L138. Linux is an open-source operating system used in Industrial Automation, Medical Devices, Telecom/Datacom and Military and Aerospace markets. It is the operating system of choice for a variety of CPU (Central Processing Unit) architectures as an alternative to proprietary operating systems. Systems built using embedded Linux typically include the boot-loader (most often Das U-Boot), a Linux kernel, and a Linux file system. The benefits of using embedded Linux include licensing cost advantages, flexibility of source code access, general familiarity, a stable kernel, and availability of a variety of applications and tools.